Epworth Sleepiness Scale: Questionnaire in which a patient rates the chances of falling asleep in various situations. The scale is used to assess the patient’s daytime sleepiness levels from supernormal to dangerously sleepy. The Rome Questionnaire: A 7 item questionnaire which is used in conjunction with Body Mass Index (BMI) to identify a patient’s risk of OSA. 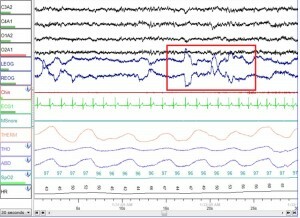 Nocturnal polysomnography: While the patient sleeps, equipment monitors breathing patterns, heart, lung, and brain activity, leg and arm movement, and blood oxygen levels. The polysomnography reports the respiratory disturbance index (RDI), which is the number of apneas or hypopneas lasting 10 seconds or more per hour of sleep. A patient with an RDI of 5 or less is considered a simple snorer with no OSA. An RDI of 5-15 suggests mild OSA, 16-30 indicates moderate OSA, and more than 30 indicates severe OSA. Home Sleep Test: A simpler test using portable monitoring devices to measure heart rate, blood oxygen level, and airflow and breathing patterns. Eden Trace: Monitors oxygen saturation, chest wall impedance, nasal and oral airflow, heart rate, and body movement. The Nightwatch System: Records eye, leg, chest and abdominal movement, heart rate, nasal oral airflow, and body position. This system can calculate the patient’s RDI and send 2 minute sections of recordings for lab analysis. The MESAM IV System: Analyzes heart rate, snoring, and saturation change to determine sleep disordered breathing. WatchPAT200: The peripheral arterial tonometer (PAT) is a wrist worn device which detects obstructive occurrences. In some cases, a sleep endoscopy may be required to determine what is obstructing the upper airway, especially if a blockage in the nose or throat is suspected. If you have any issues with snoring or possibly obstructive sleep apnea, schedule an appointment with one of our physicians at Fort Worth ENT & Sinus. Please complete an online appointment request or phone 817-332-8848.